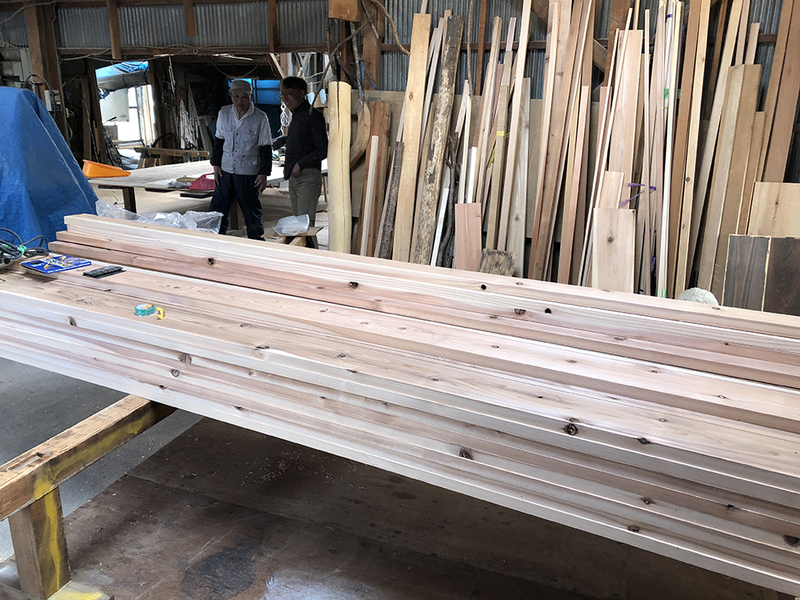 I visited a carpenter's processing site before the erection of framing. I ask them to process the wood used for the top of the roof. The processing site was very large and the facilities were complete. And above all things are tidy. The arrangement of objects is calculated from the delivery of materials to the processing and dumping of waste. 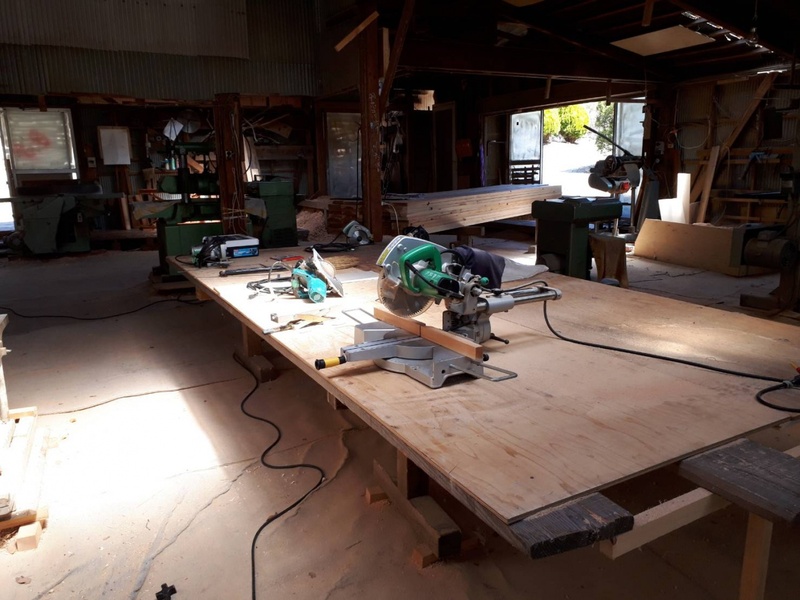 I saw the figure of a carpenter who thoroughly followed safety first. Last week was a nonseasonal cold wave. Even in Karuizawa, there was about 20 cm of snow. 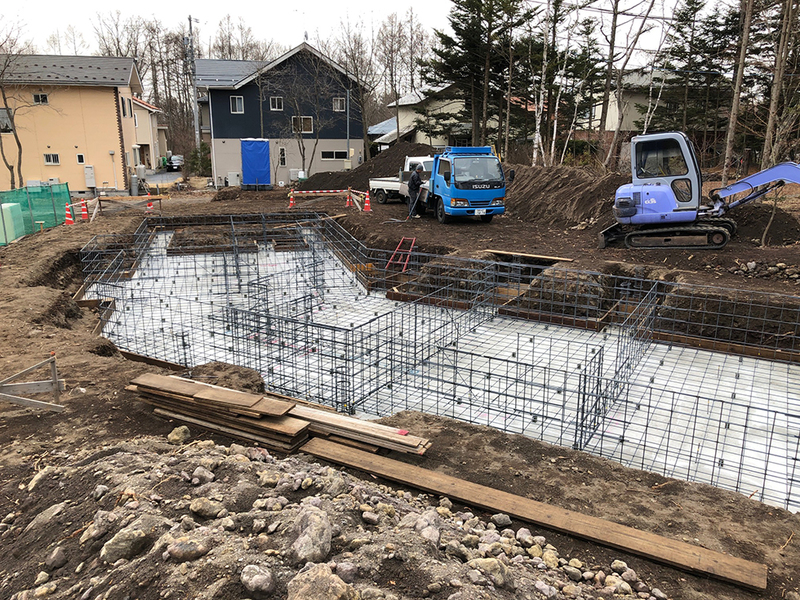 The foundation has been carefully cured before it snows. It is firmly fixed with a rope or wire and can not be turned over. 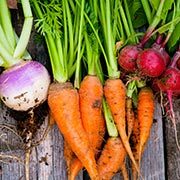 We can safely spend the curing period. 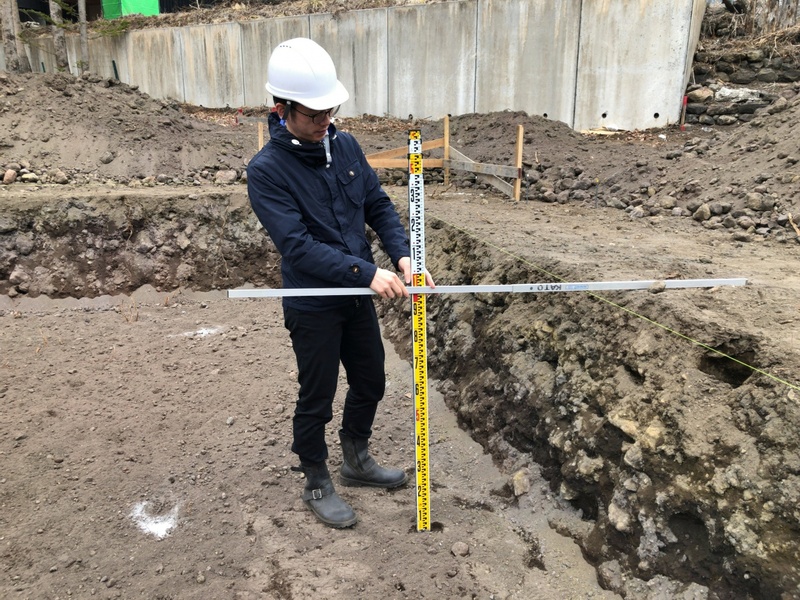 The shape of the foundation is designed in consideration of the strength of the ground and the freezing depth of the area. 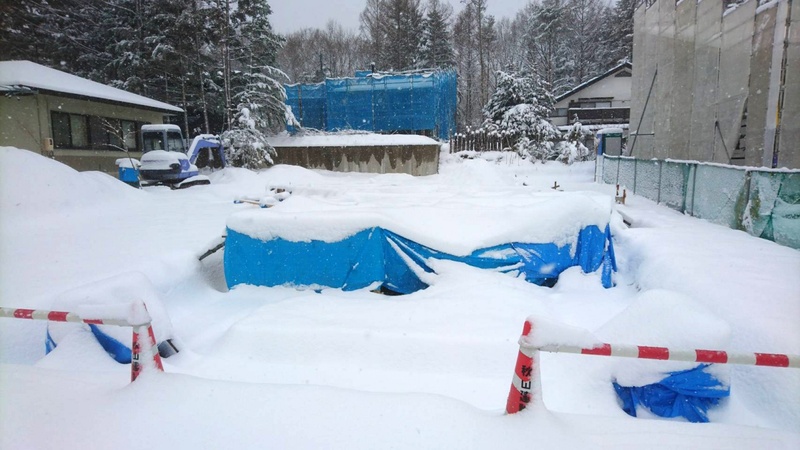 Freezing depth refers to the depth at which the ground freezes, and it is said to be 70 cm in Karuizawa. 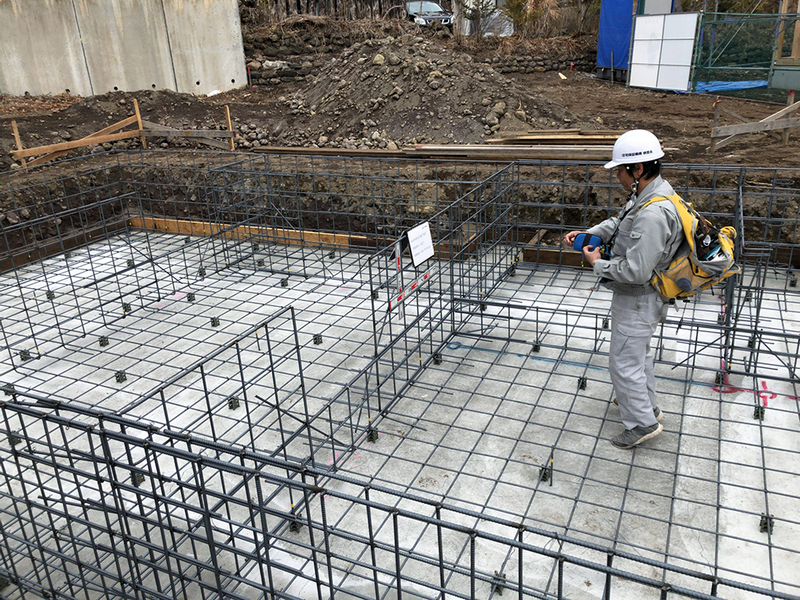 This kind of deep foundation is unique to cold regions. It is progress confirmation while being drowned in the polite work. 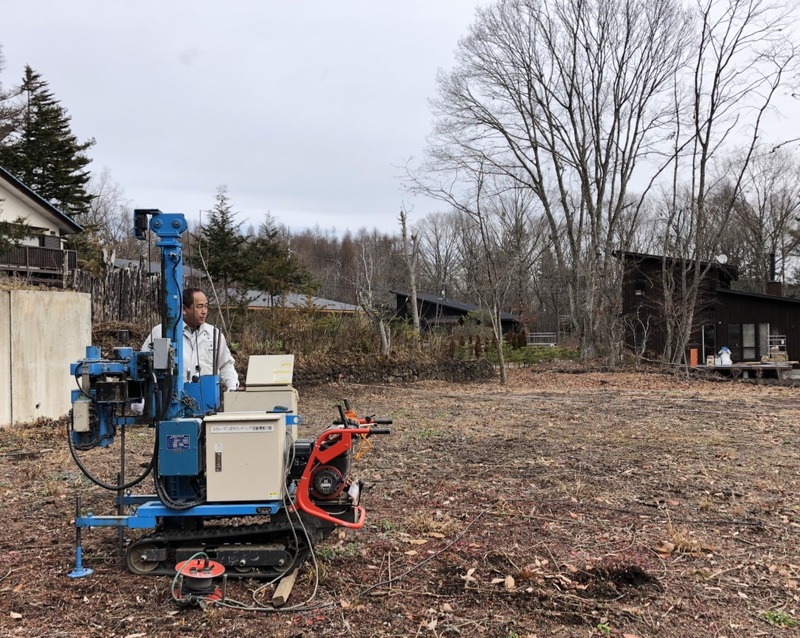 We will check if the ground is dug up to the planned depth called "Negeridoco". It looks like it's coming spring this year without falling snow. It is a good condition to proceed with the construction, but something is not enough. 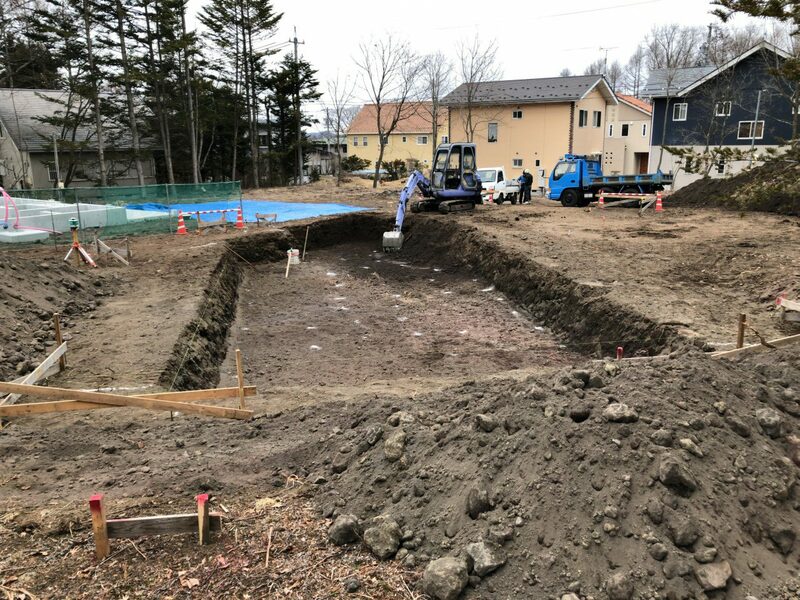 After completing the application procedure, the construction work has started safely. First of all, we will set up temporary structures to accurately locate the building. We also confirmed the basic dimensions such as height and horizontal. We will also maintain an approach road from the road and start the foundation work. March 3rd is the Doll Festival. Karuizawa started snowing around noon. In this weather, we did the Groundbreaking ceremony with the owner's family. We pray for Greetings of the Earth and safety of construction. There were some people who were recently immigrated and one where they once lived in Tokyo when they greet neighboring greetings. "If you have something you do not understand, please ask me anything." 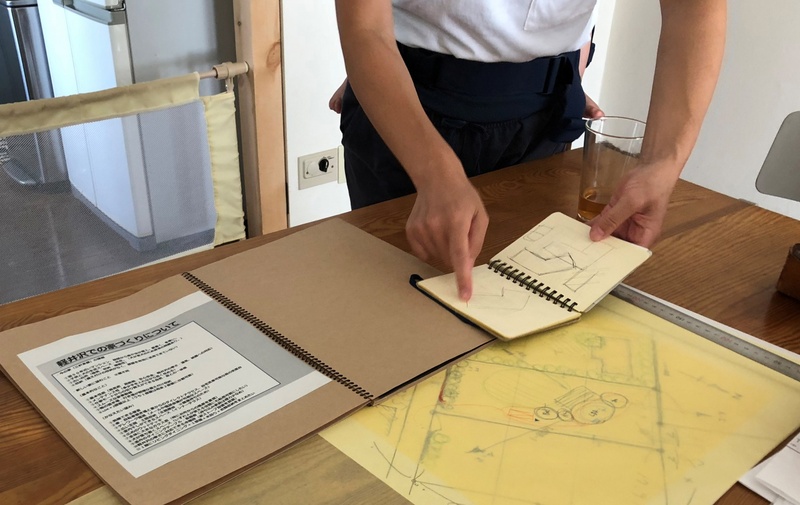 Various application relationships, drawings for construction, etc. have been made. 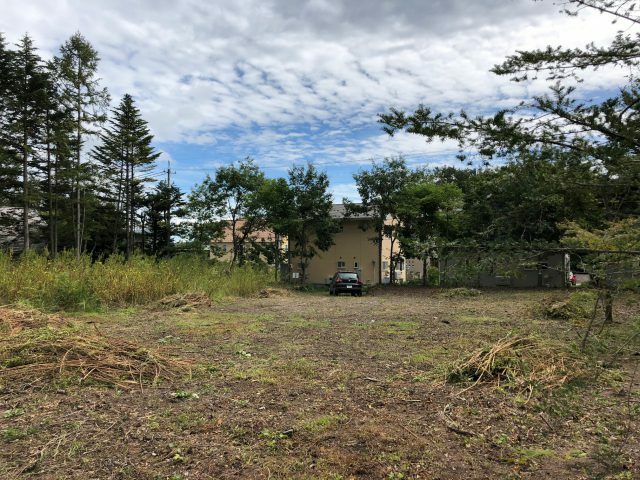 I was ready for construction start. The final decision on the material is time to raise. Still, the owner goes to the showroom to imagine the space. There are more scrapbook pages such as kitchens, washbasins, lighting fixtures and more. It is not too beautiful, it is not too rough, and it will aim just for the good points. Hard metal such as railings and hanger pipes on the stairs make it as black as possible. The washbasin is also considering cool stainless steel. Indeed, there is sense of unity in the image. We have entered the stage to realize it. A revised plan reflecting requests. We improved the living space where there was a little waste. Hashizume created another appearance model to convey the difference with the previous one. 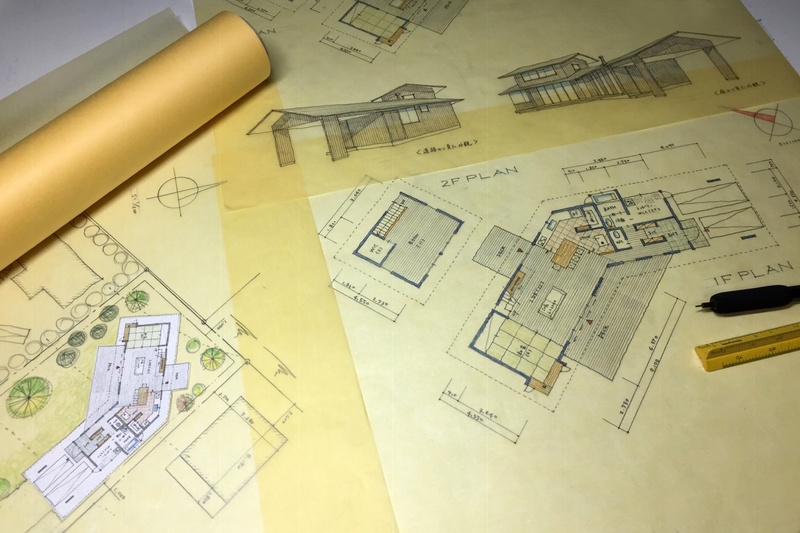 In the previous plan, the room which was tatami was changed to flooring upon request. By narrowing down the living room, continuity of the space was made, and a good change was born. The margins for creating a useless space and the future path of living are different. "Looking" power helps to discover. "Watching" with the household. 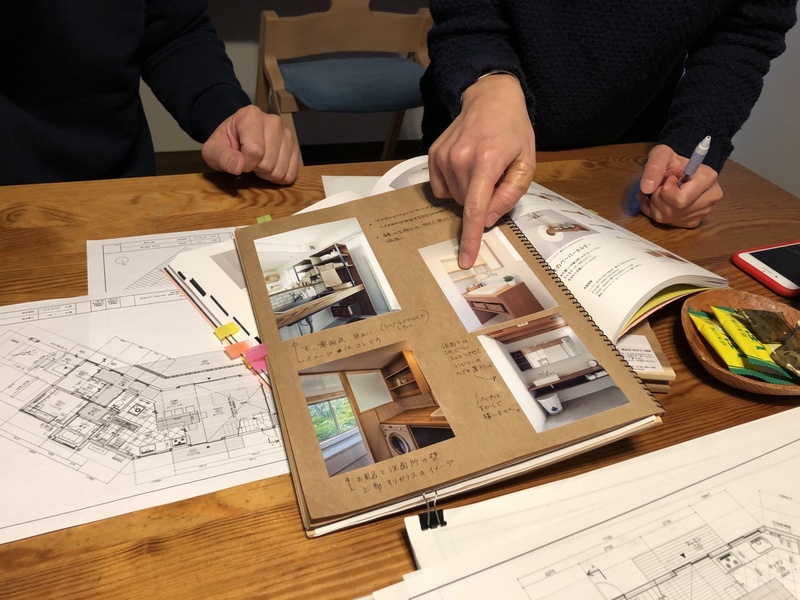 I think that it is an important task of the designer. 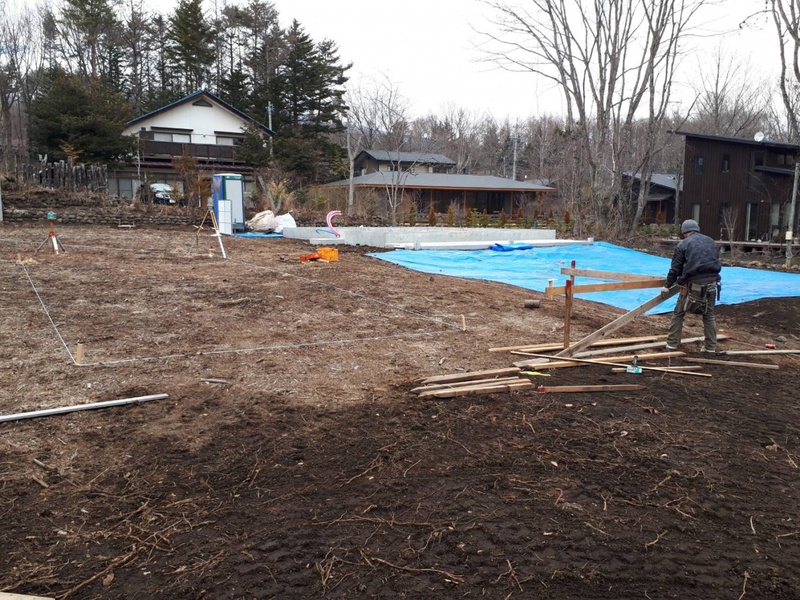 In Karuizawa, construction of houses, villas and hotels has been continuing one after another. A new building is about to be built on the east side and the north side. If you plan to build it later, you can consider it after looking at the surrounding houses. Let's check with appearance model. Window position etc are confirmed on site. LDK facing the south, deck making use of the north triangular garden. Place trees where you want to secure privacy. We are conscious of the gentle connection with the surrounding environment. 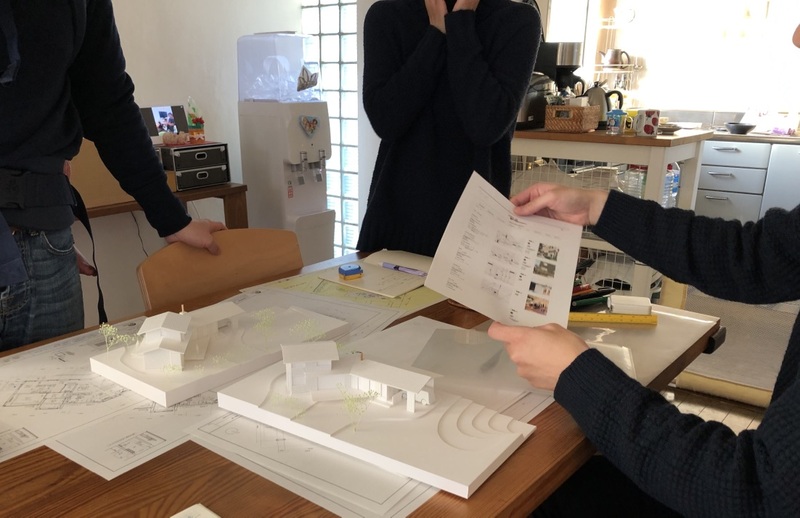 Mr.Hashizume makes an appearance model and interior perspective, and is also progressing three-dimensional examination. 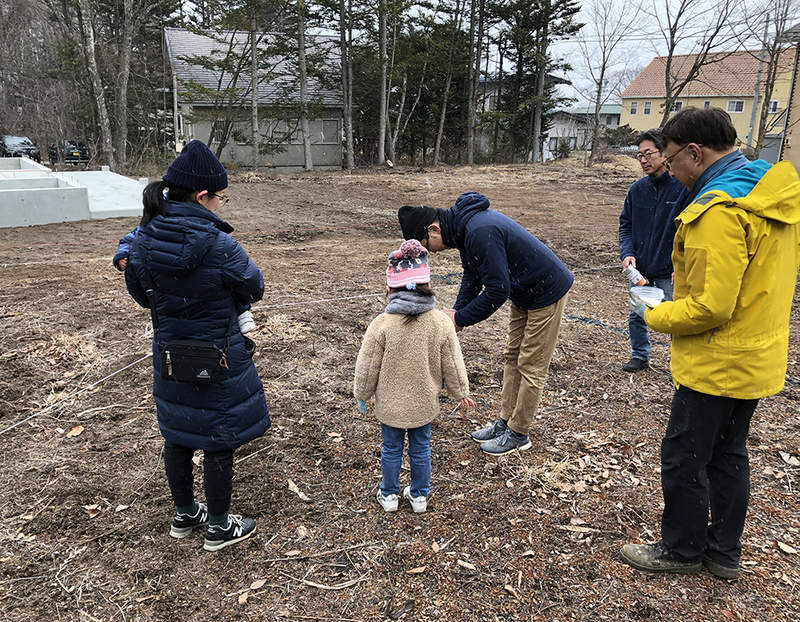 The placement plan was decided, and today it is a ground survey. 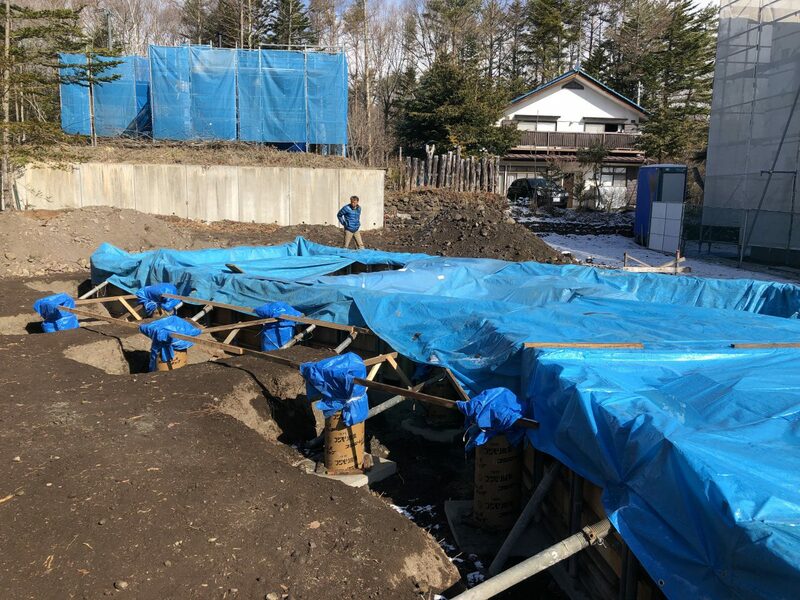 In Karuizawa there are many cases where ground reinforcement is necessary. However, even inside Karuizawa, there is a relatively good site in OIbuki. It seems that a gravel layer of stone appears in shallow places. We are waiting for the analysis result. The owner wishes a bright and open space. I exchanged e-mails and asked them at their house and repeatedly considered plans. The corridor that was on the northern side in the first plan moved to the south side with the image of the edge side. We set up a deck in the north and south of LDK to create a comfortable space. Storage is indispensable to make the space look beautiful. a walk-in closet on the second floor. I was able to investigate the floor plan over time. Next, I will conduct stereoscopic examination using the external model, interior perspective. It becomes a hint of knowing how to build without imposing on the environment. 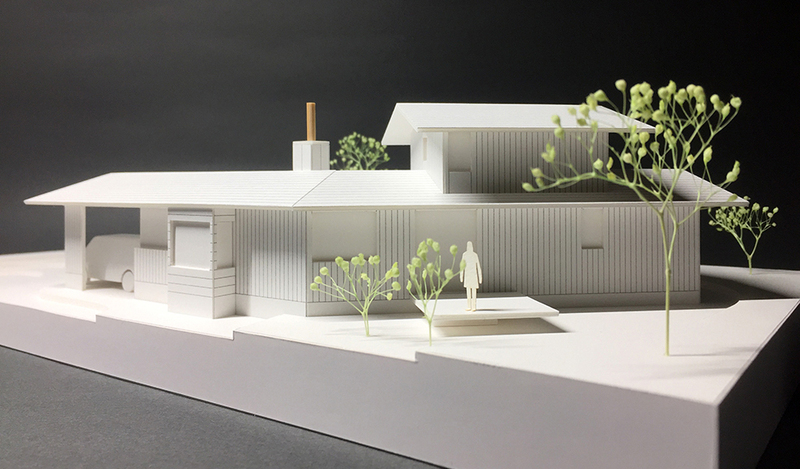 Asking the request of the owner living there,We will consolidate into one form of architecture. 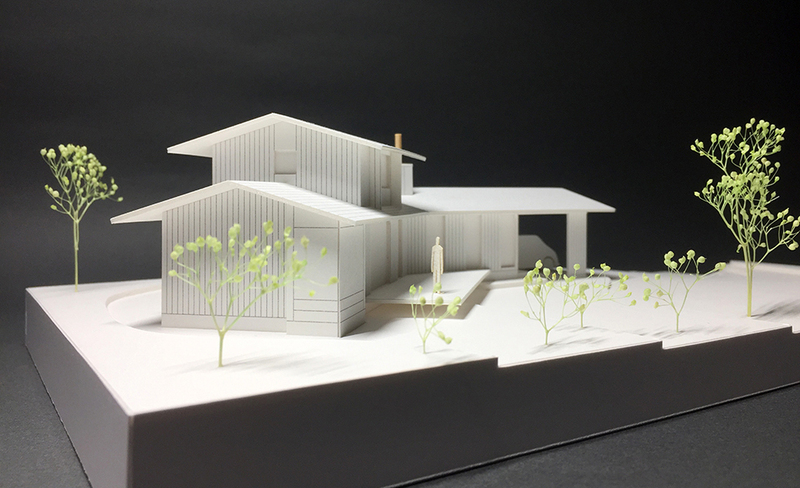 This plan not only incorporates the sun's light,The sense of distance with the neighbor is ideal just right. You can enjoy an open garden on the south side and a private garden on the north side. 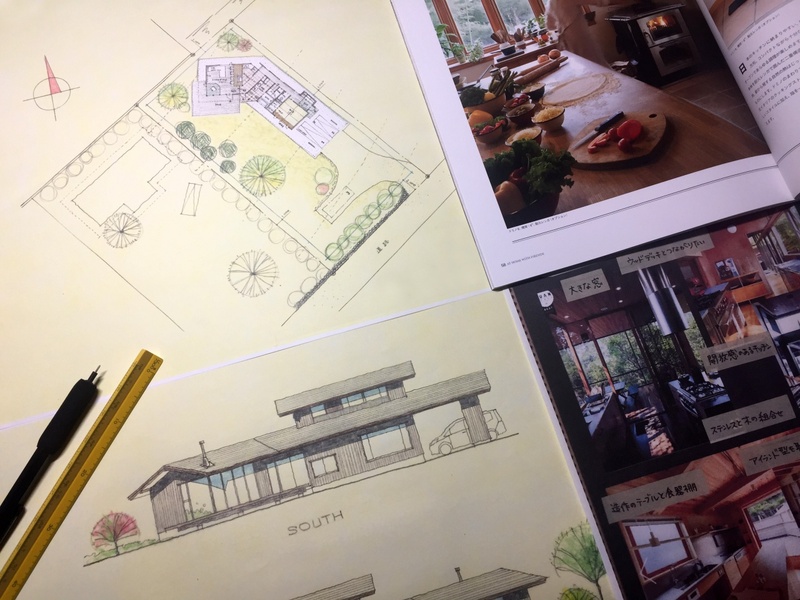 The kitchen is in the center of the house, it will be the start point of household chance line. Next, take a bath, wash and change clothes, laundry / indoor drying, how to store storage space. Discussion begins with the owner. I went to my owner's home before presentation. I talked about the plan's hearing and the feeling of the land. The site faces southeast roads. The building looks southeast as you look around. Is it the right answer? Light is an important point for buildings. It is an environment where you can see the west scenery and light from the south. Therefore we suggested zoning with LDK directed to the south. They showed me a sketch. It seems that you already shared the image! The first floor places importance on household chronology and takes the layout centering on the kitchen. We also received requests from each room. It will take a concrete plan immediately. It is a migration plan from Tokyo to Karuizawa. The location is an area where they can commute by Shinkansen. They want to immigrate in March 2020. Considering their child's kindergarten graduation, that is a good timing. I imagine the scene where their families spend lively. Children running around wide garden. Elementary school friends will come and visit. The owner is good at cooking. There are times when a large number of customers come, such as a birthday party. I will imagine the connection of comfortable space.